The picture was created in the winter of 1909 in a small estate Neskuchnoye. 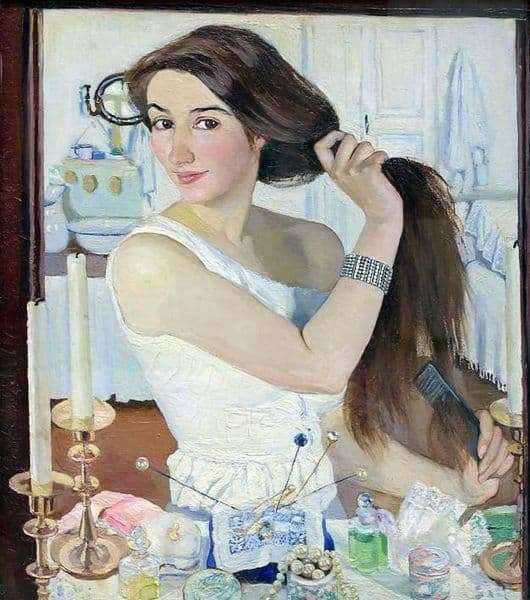 Artist Zinaida Serebryakova was then 25 years old. She was waiting for her husband, who was going to call on her and her children, returning from Northern Siberia. Christmas planned to meet in St. Petersburg. That morning was dazzlingly sunny and frosty. The happy young woman, woke up in a sunlit room, got up and, going up to the mirror, simply smiled at her sweet reflection, began to comb her hair. A simple plot, cute female trinkets on the table in front of a mirrored frame – bottles, knitting needles, a candle reflected in the mirror, a simple interior of a rustic room behind your back. Slender, beautiful, barely veiled female body, coquettishly lowered from the left shoulder the strap of a nightgown, a silver bracelet on the wrist of the right hand, which keeps the magnificent, long, dark hair. In the left hand comb. The picture is full of sunshine and clean air. The look of black, mischievous, happy eyes attracts attention, is the dominant accent of the picture. I want to look at these beautiful eyes for a long time and intently, so alive, filled with the joy of life, the energy of youth and deep sincerity. In a raised bend of black eyebrows, in a half-smile of bright, rich lips, in a playful turn of the head one reads simple human happiness, for which not so much is necessary. “Self-portrait” is still an exhibit of the Tretyakov Gallery, and for Zinaida Evgenievna herself, it remains a reminder of those amazing days filled with a genuine feeling that are irretrievably gone. After only 10 years Serebryakova, having buried her husband, will bring up four children herself, look after her sick mother, but will not cease creating. Her paintings amaze with the depth of the inner meaning and freshness of the external charm. The artist’s self-portrait is considered to be the best.